Just outside the 1st gate of Jaisalmer Fort, Hotel Jeet Mahal is housed in a heritage building built by a royal architect in the early 18th century. Camel rides, theme parties, folk dances and overnight safari tours are some of the activities guests can look forward to while staying here. Fitted with air conditioning, all rooms come with a TV and a desk. Private bathrooms are equipped with a shower. 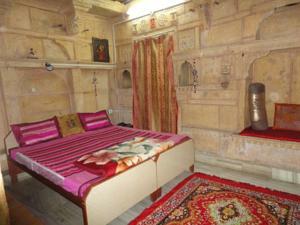 Hotel Jeet Mahal is 1 km from Jaisalmer Bus Station and 2 km from Jaisalmer Train Station. Jodhpur Airport is about 350 km away. Guests can arrange guided city tours at the tour desk, or mingle with the locals in the nearby market. Laundry services, daily newspapers and a 24-hour front desk are also available. The on-site vegetarian restaurant serves Indian, Chinese and Continental dishes. Wi-fi is available in the entire hotel and costs INR 60 per 24 hours. Free! All children under 5 years stay free of charge when using existing beds. One older child or adult is charged INR 300 per night and person in an extra bed. Maximum capacity of extra beds in a room is 1. There is no capacity for cots in the room. Supplements will not be calculated automatically in the total costs and have to be paid separately in the hotel.